As the last of the golden leaves have fallen and the magnificent Autumnscape is replaced with barren trees and frosty fields, December comes around and I begin to crave spices, warming stews and curries. My kitchen itches for me to bring together flour, sugar and spice and that bottle of rum to plump up the dried fruit and maybe a nip between whisking and beating. While outside the gravel-grey skies are bare and the biting winter winds have stripped the last of the leaves from the trees, inside the inviting glow of the candles promise cosy warmth. One of my favourite things to do as it begins to darken and the lights begin to come on from window to window, is to take a walk through my neighbourhood. December provides such a lovely, at times gaudy glimpse of living rooms and kitchens. I steal past the windows trying to catch glance of a Christmas tree, colourful baubles, decorative creations or sparkly fairy lights. On some lucky days a window will be tilted just slightly and the air is filled with scents of incense, citrus, spices and sumptuous aromas of a roast. Back in my own kitchen I turn on the kettle and welcome the sound of the rolling boil. Tea-leaves, ginger and whole spices come alive as they steep in the tea pot. My mind is inspired, awakened by the sensory experiences from my walk. 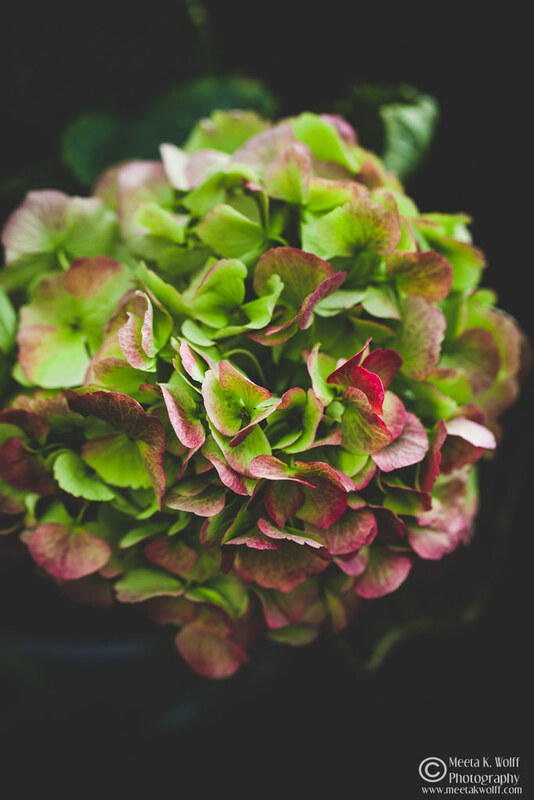 The cold crisp air has not only stimulated my cheeks to colour red but has invigorated me with energy and ideas. Warmth floods the house as I light the candles and the strings of paper star fairy lights dangling from the staircase. 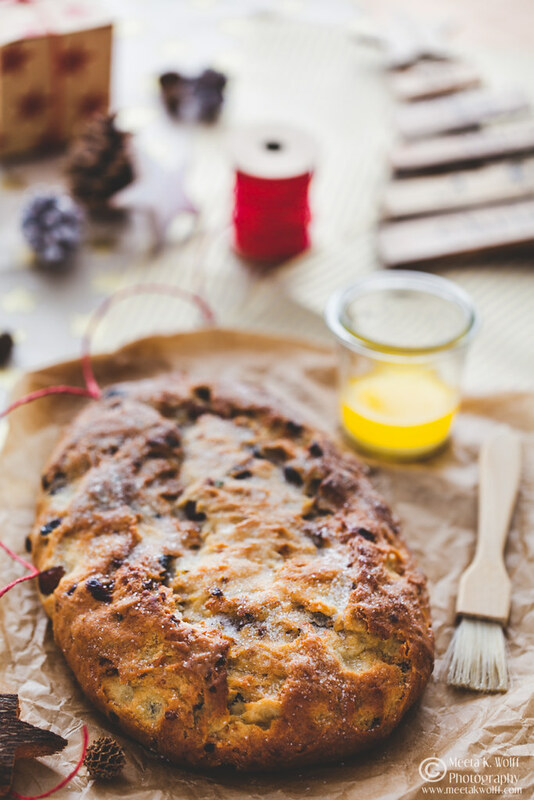 It’s December and I submit myself to flour, sugar, spice and my annual stollen baking. What started as a simple experiment has developed into a pretty steadfast tradition at our home. 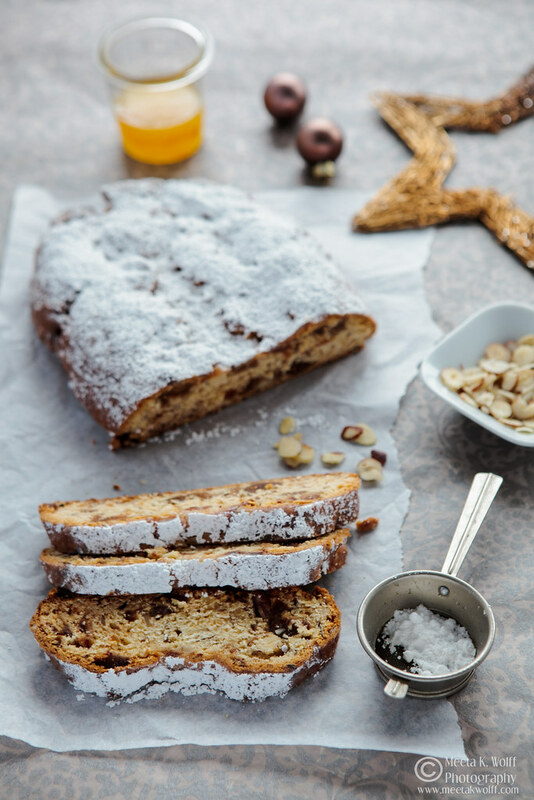 When I first arrived in Germany over 20 years ago I brought with me my family’s traditional Fruitcake and I developed it to create the Florentine Christmas Fruitcake. Once I began to learn the Christmas rituals and heard the stories from my German husband’s mother and grandmother I was intrigued to try some of the German recipes from their cookbooks and recipes. 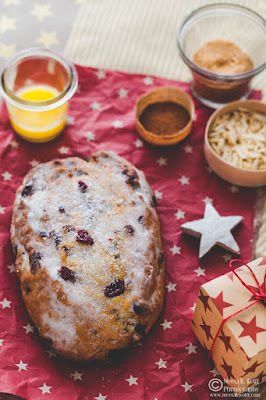 A Christmas stollen is part of many German households. My mother-in-law told me stories of how “back in the old days” the entire family would get together several weeks before Christmas eve and the kitchen was transformed into a factory line of stollen making. Kneading, mixing, rising, shaping, - several stollen loaves would be made this way in 2 to 3 days. All of them were lined on baking trays and stacked on top of each other. Covered with kitchen towels they were then loaded onto handcarts and taken to the nearest bakery where they would be baked in a proper oven. Each family was given a special time to bring their stollen loaves and a time to pick them up. Often, while they waited for the stollens to be baked, many families would stroll in the park, sipping Glühwein and chatting to neighbours while the kids would play in the snow. I often have that romantic image in my head when I bake my own stollen now. I have to admit it is a tedious job and can understand why it was often a family affair back then – especially when 10 or 20 loaves were made. Today I have the help of my stand mixer and often make 2-4 stollen loaves, which my oven can handle quite well. This year I baked two different kinds of stollen. The fairly traditional quark and butter stollen with lots of fruit peel, dried fruit and butter is moist and the quark adds a light airiness to the cake. The recipe is adapted from an age old recipe my husband’s grandmother gave her daughter (my mother-in-law) who then shared with me. I tweaked it a bit adding the quark and the combination of spices. The original recipe included only cinnamon and vanilla. In a bowl mix together the lemon zest, dried fruit, candied fruit peel and rum. Allow to soak for at least one hour. In a bowl of a stand mixer attached with the kneading hook add 600g flour, baking powder, sugar, 175g butter, quark and all the spices. Knead in the mixer until everything comes together. Turn the dough out on the counter and continue to knead with your hands. You should have a smooth, pliable dough. Add the rum soaked fruit and nuts and knead until evenly spread throughout the dough. Sprinkle some flour on the counter top and form the dough into and oval loaf then cut a groove down the middle of the loaf about 1 cm deep. Press the groove a little apart. Allow the dough to rest for 30 minutes. In the meantime pre-heat the oven to 150 degrees C. Line a baking tray with baking paper and bake the stollen for a total of 1 1/2 hours. After a baking time of 1 hour cover the stollen with thick aluminium foil and place a second baking tray under the first one. Melt the remaining butter. Take the stollen out of the oven and while it is still hot brush generously with butter then sprinkle granulated sugar over the top. Allow the stollen to cool completely. Then wrap in waxed paper and aluminium foil and keep for one week in a cool and dry place. The stollen needs to mature or it will be bland and simply fall apart when you try to cut it. Butter is part of this recipe so please do not substitute this with margarine or any other fat. You can grate some marzipan into the dough as a moist alternative. When you add the soaked fruit and nuts, make sure you knead the dough well to really get the fruit into the dough. Butter and sugar give the stollen a longer shelf life. Apparently my mother-in-law has said up to 3 months. Our stollen has never lasted that long! 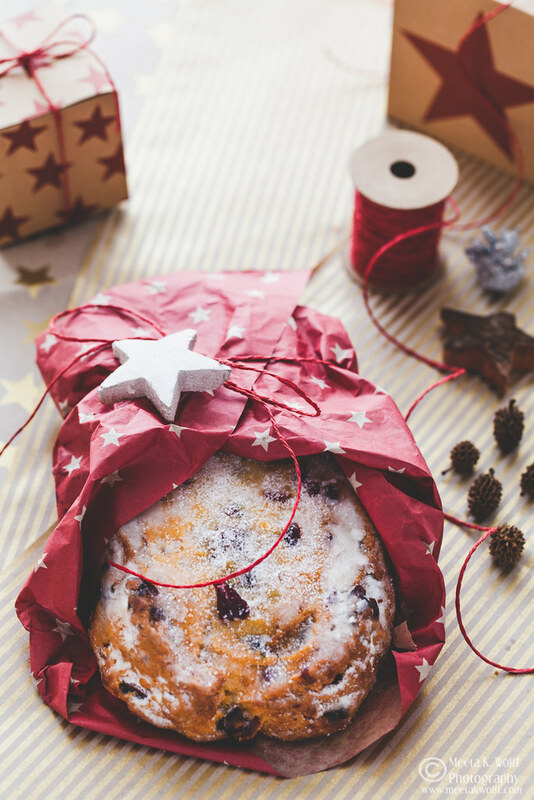 You can freeze the complete stollen in the freezer and then allow to thaw at room temperature overnight. Make sure you pack the stollen well before freezing to avoid freezer burns! My experiment stollen this year was the divine cranberry spelt and almond butter stollen. Not traditional but so moreish – moist, boozy, fruity and nutty and definitely to become a classic flavour combination. 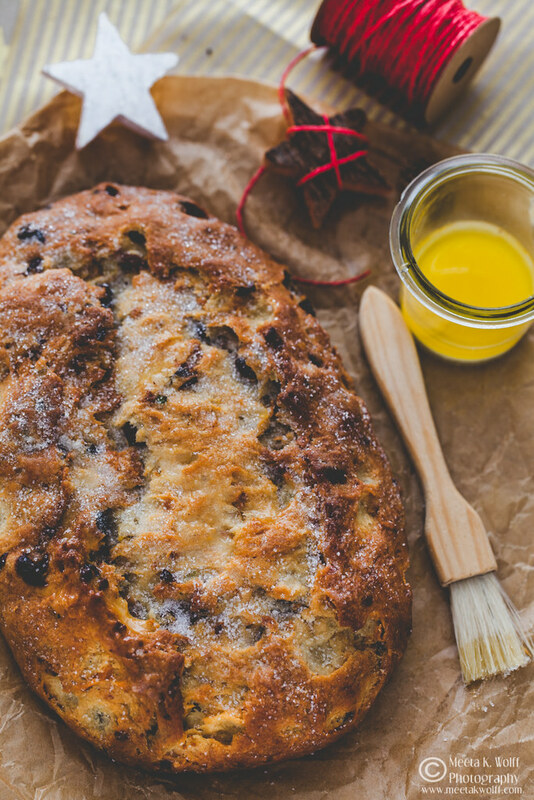 Now is the perfect time to bake a stollen. It needs at least a week maturing time for all the aromas to unfold and the spices and fruit to mingle into a wonderful mix of flavours. 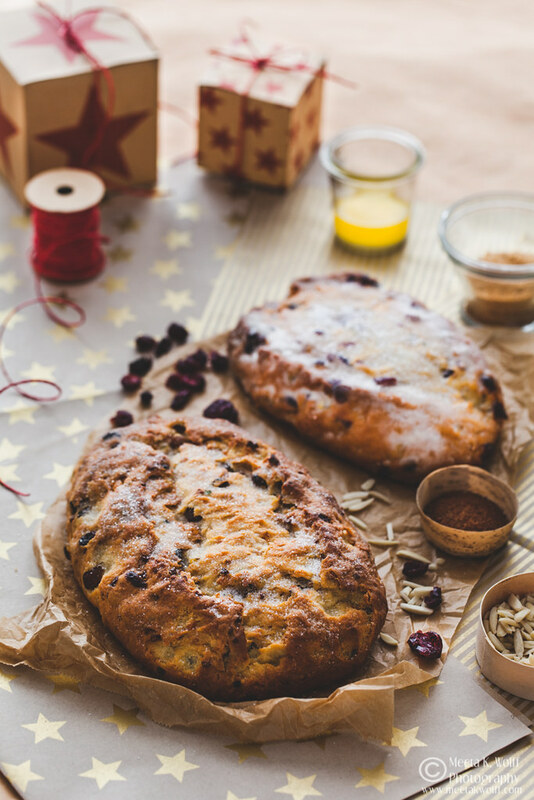 These two are fantastic – however at the bottom of this post I have shared a couple other stollen recipes from past years. I am sure you will find one that entices you. Coarsely shop the cranberries and allow to soak in the rum for at least one hour. Place the spelt flour in the bowl of a stand mixer and make a well in the middle. Add the yeast and sprinkle some of the sugar over the yeast, then pour about 50ml of the milk. Tightly cover the bowl and allow the yeast to stand. Once bubbles begin to rise from the yeast quickly stir the mixture. Then add all the ingredients except the cranberries and almond slices. Using the hook attachment of the stand mixer. knead the dough very well making sure it come together smoothly. Transfer the stollen dough to the counter top and add the cranberries and almonds. Give the dough another good knead to spread the fruit and nuts throughout the dough. Cover and allow to rise for an hour. Sprinkle some flour on the counter top and form the dough into and oval loaf then cut a groove down the middle of the loaf about 1 cm deep. Allow the stollen to rest for another hour. Line a baking tray with baking paper and bake the stollen for a total of 1 hour. Keep an eye on the stollen if it begins to darken cover the stollen with aluminium foil and place a second baking tray under the first one. Melt the remaining butter. Take the stollen out of the oven and while it is still hot brush generously with butter then sprinkle icing sugar over the top. While it is still warm wrap aluminium foil and keep for one week in a cool and dry place. The stollen needs to mature or it will be bland and simply fall apart when you try to cut it. The longer you allow it to mature the moister and tastier it will get. 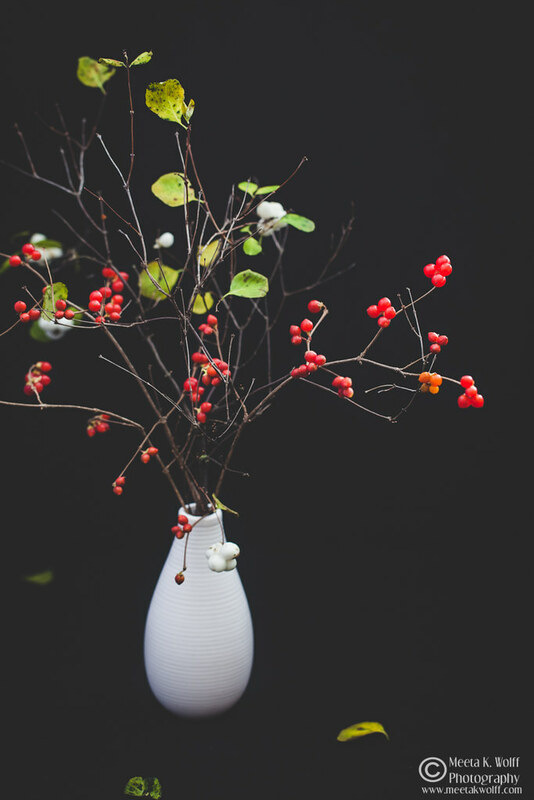 During the walks I take in the fields and around the neighbourhood I always find a few twigs and leaves that I bring back home to decorate a corner of the home with. I admit I often go without my camera so I can just clear the head. 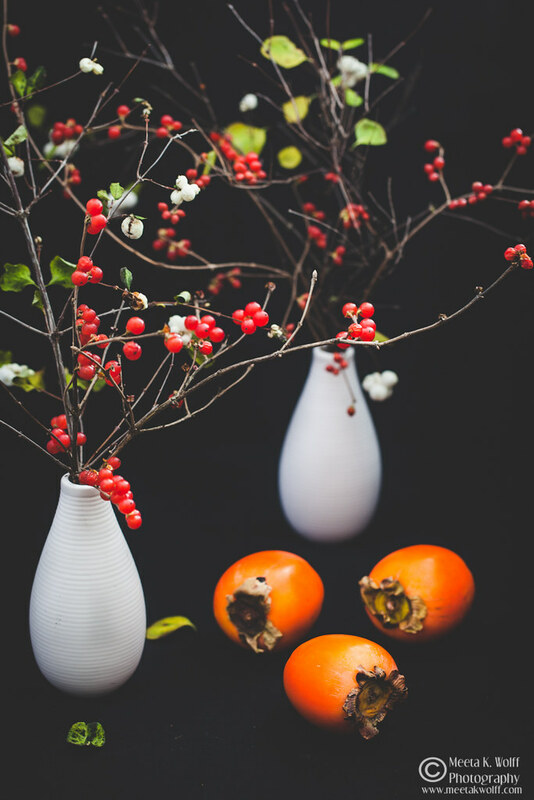 Especially in winter – even when most of the trees have shed their leaves there are always the berries or fruit that are left hanging on the branches. They make such unique pieces to decorate the house with. 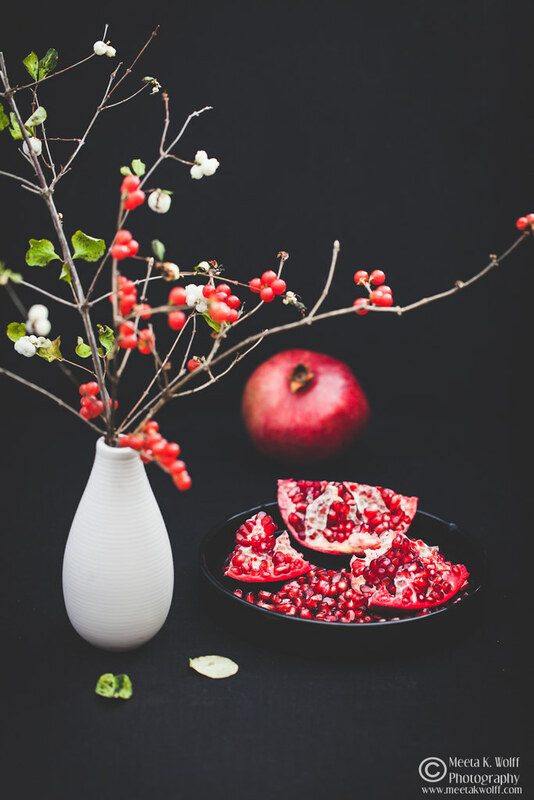 Together with the pomegranates and persimmons I found at the market I decided to spend an afternoon just shooting some still life – something I do not do often enough! Both these stollen recipes are grand and I feel accomplished at having tweaked the recipes so successfully. They make the perfect gifts for the family or as a bring along to a Christmas teas party or to indulge in at the office with your colleagues. 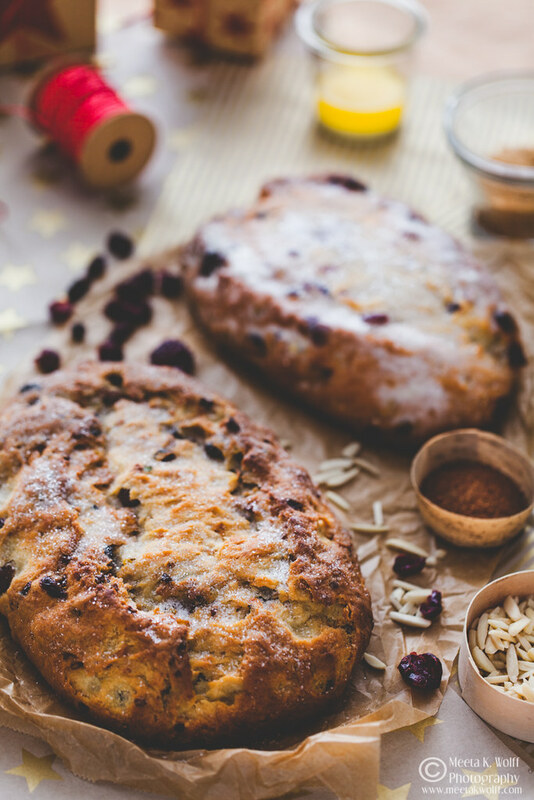 I often shape the stollen in simple loaf forms as it is easier than the typical stollen form and I do not see the need in investing a special stollen form when my loaves look kind of pretty. It’s December! So I hope you enjoy the month with baking, walking around the neighbourhood, relaxing and just taking a moment or two for yourself to reflect on the year past. Next week I will be back with my big Christmas cookie post so look out for that! 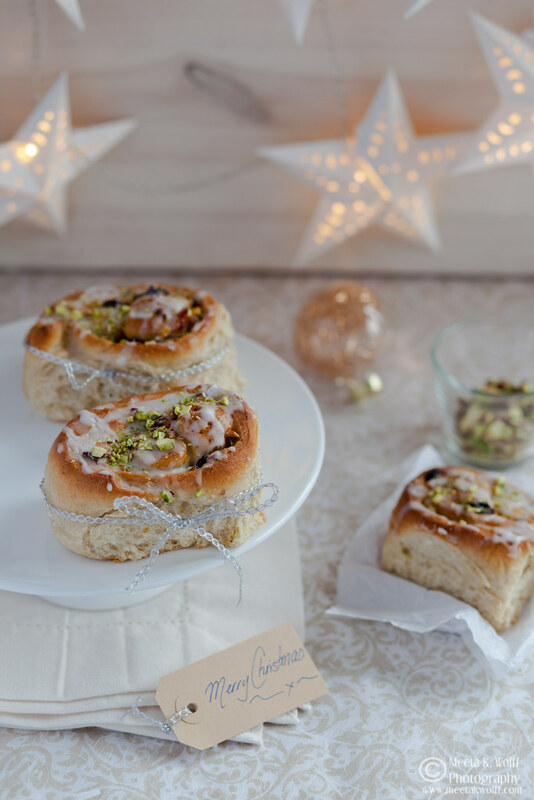 Looking for more ideas for Christmas baking? I thought so! Earlier this week, I asked my friends and followers across my social media platforms to share their favourite Christmas cakes, baked goods, loaves and treats. As always I was not let down. From Facebook to Twitter - I got so many great suggestions and exceptional feedback that I am sure each one of you will find something special to bake. There are scones, brioche, scrolls, buns, logs, tarts, focaccia – and we literally will take you across the globe with all of these recipes. I have created a Pinterest board which includes over 100 recipes I got as a result of my request. Come on over and check out 2016’s …. 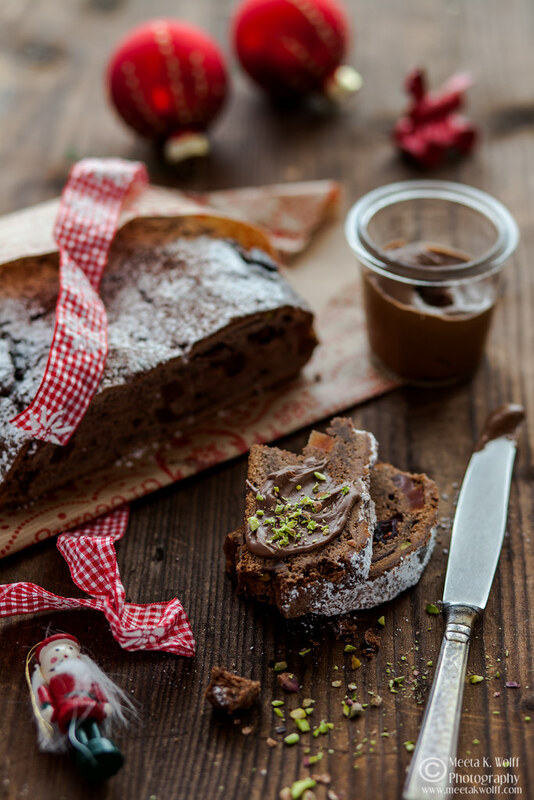 Do you have a perfect festive baked treat that has to be a part of this board. Just add your link in the comment field and I will pin your recipe to the board. Wonderful Stollen. Very original. Not sure if I will be able to bake one this year (I can't bake too much, otherwise me and my BF won't be able eat all the stuff I make... ;-) ). Both of these look sensational! 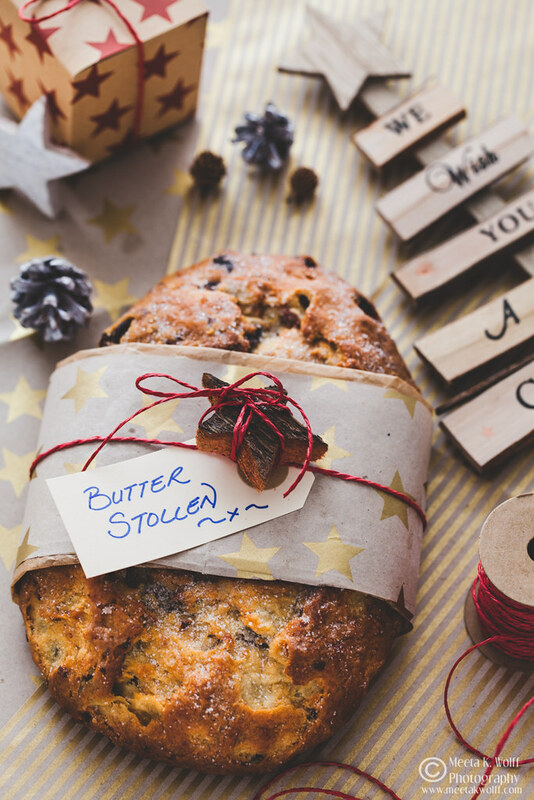 I've never made a stollen but I may just give it a go this year, thanks! The photos are gorgeous!! The stollen looks AMAZING!! Wow! 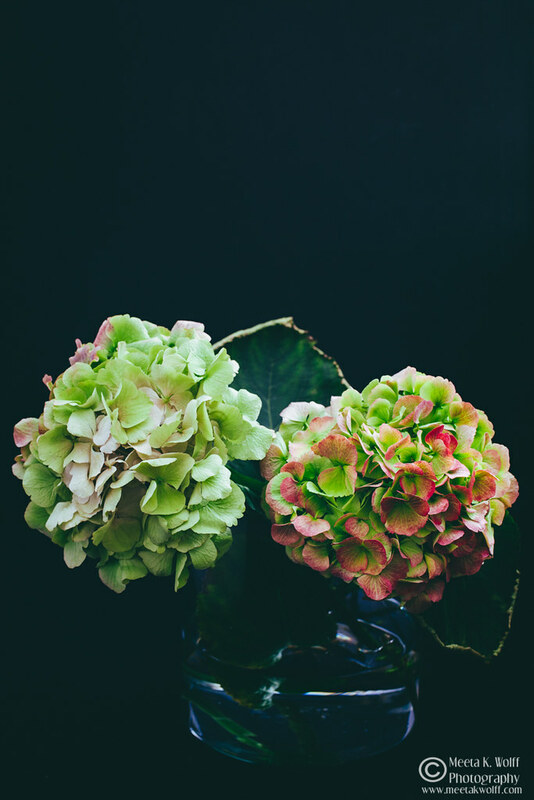 That is so rustic and beautiful, I just love your photos! I've never made stollen before, but that one looks absolutely glorious! Your photos are magnificent! I've never tried stollen, but now I really want to! I love everything with cranberries and almond. wow This looks so amazing! And your photography is just as beautiful! Oo I've never tried this before. It looks delicious! I am a huge fan of cranberries. What a wonderful mix of traditions! Your photography is stunning and the breads look delicious! Your pics are mesmerizing. I'm a big fan. I think its possible that even I might be able to make this recipe. Never had these and they sound and look delightful! Might just give them a try! Wow! That looks so festive! It's the kind of bread you'd want to wake up to on Christmas morning! I'm sure it tastes delightful! These is looks so delicious i always see foods today. I'm starving and want to eat any of those foods. Looks very authentic and I love the wrapping and photos. Aside from making this for the family, it would be a nice gift to neighbors as well this Christmas! It's so nice and it's packed with so much goodness! I love trying new to me ingredients and there are several in this recipe. Thanks. This looks really delicious! I am going to have to give this one a try for sure. ahaha howcome i’m seeing cranberry recipes everywhere this week? is it a theme or competition everyones involved in?